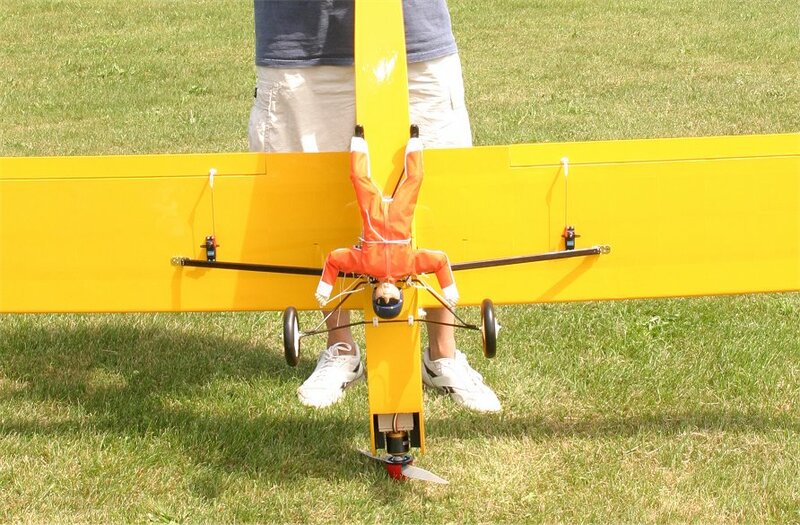 The Beginner Combo R/C Sky Diver from R/C SkyDiving.com is one of many products and combo packages that include a complete sky diving setup except for the radio gear. 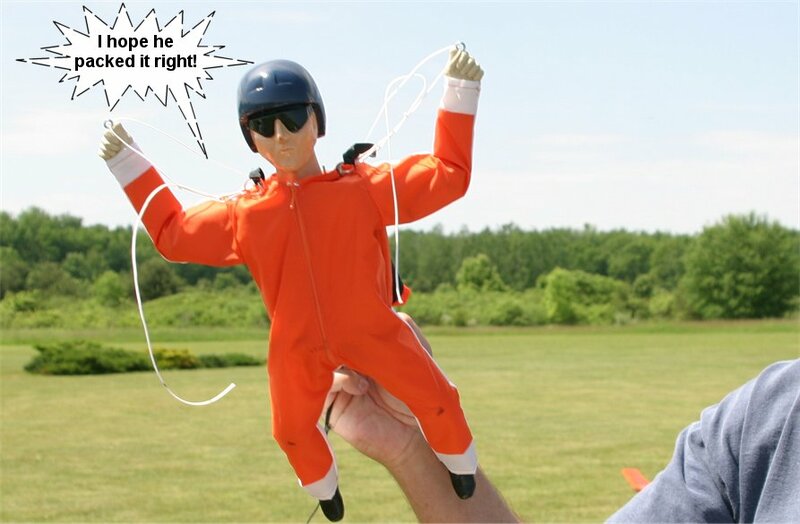 The Beginner Combo skydiver package is designed for someone who wants to get into skydiving at an affordable cost but not sacrifice performance. 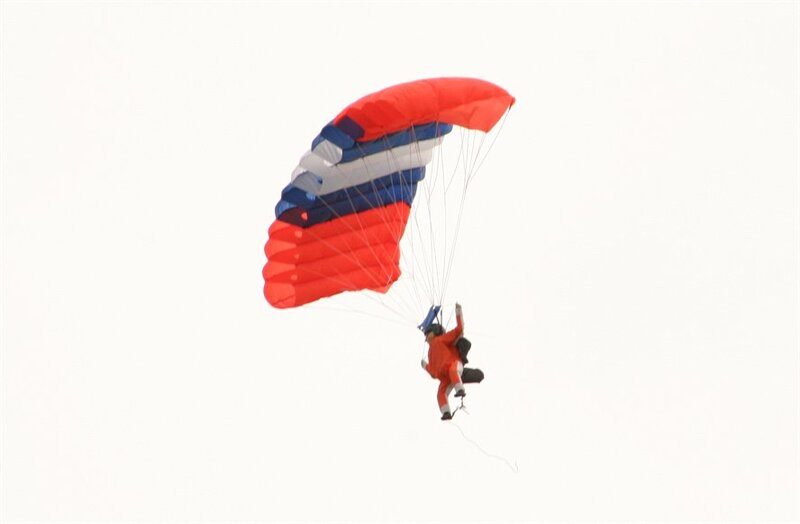 The Beginner Combo uses a braided nylon rigged parachute with a stationary slider, a tri-color jumpsuit, and a complete New Generation Jumper capable of freefalling. 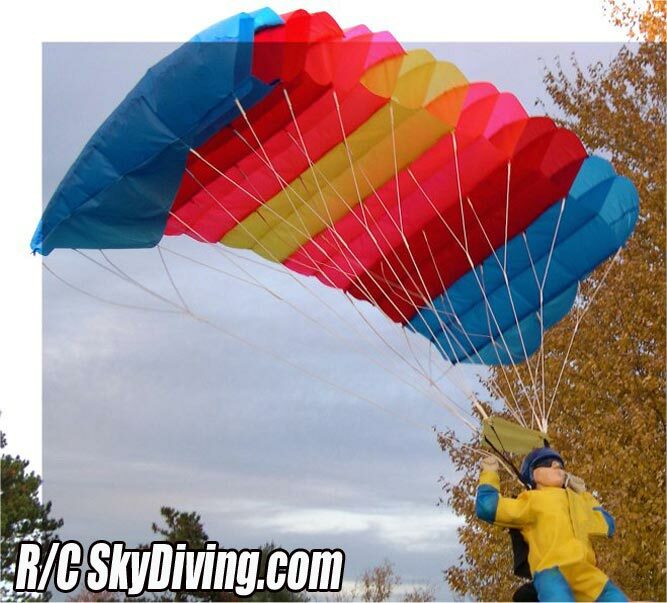 This diver handles up to 10 mph winds well and is a good start to your skydiving experience. 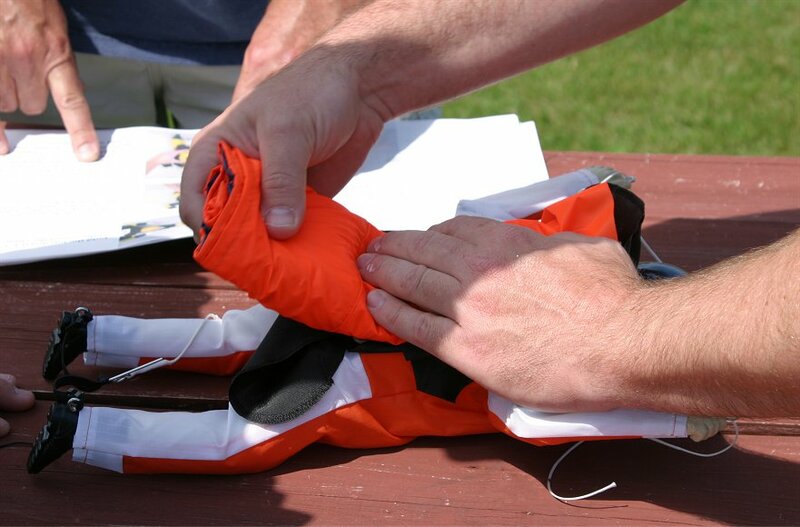 The parachute comes fully rigged with a complete packing guide. 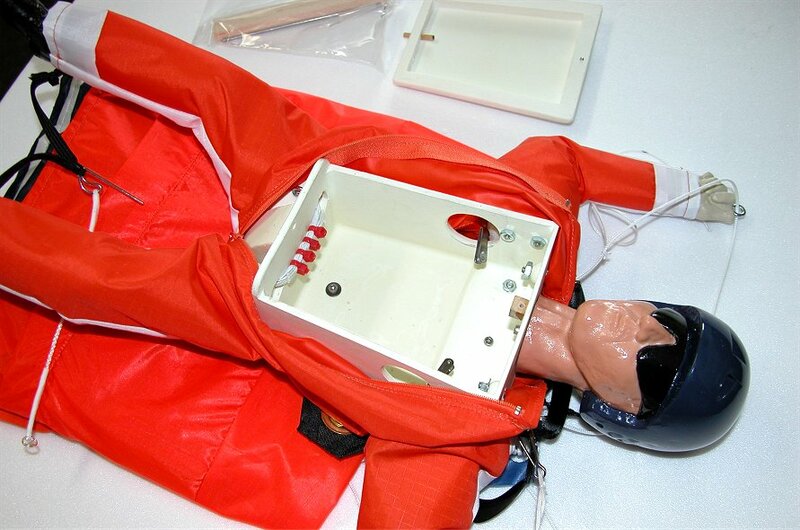 The skydiver includes everything but radio equipment. 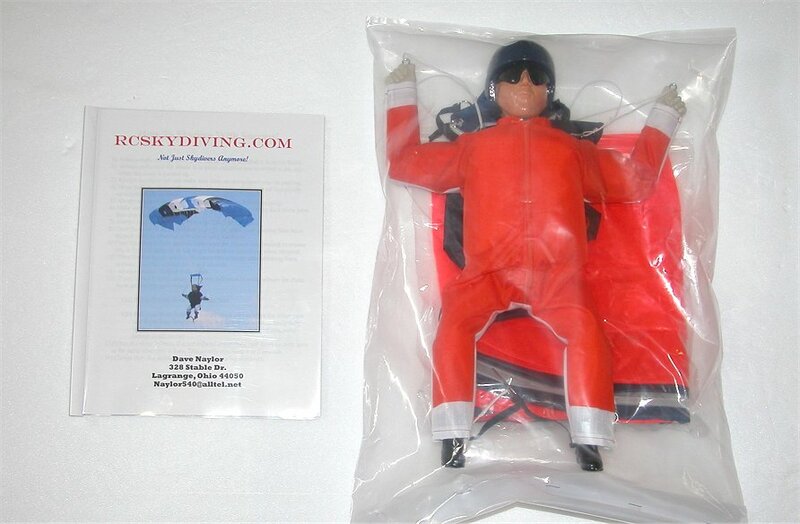 It comes with a beginner parachute and a beginner jumper suit. 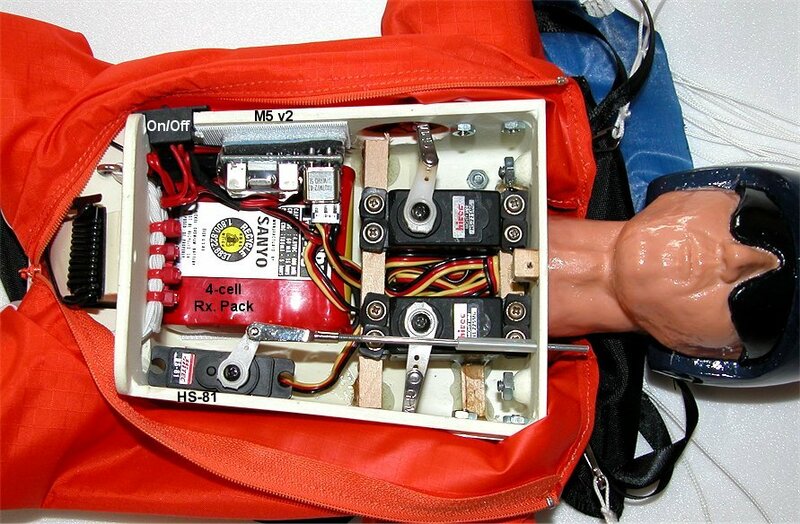 The manual suggests various radio components and provides several different layout options. 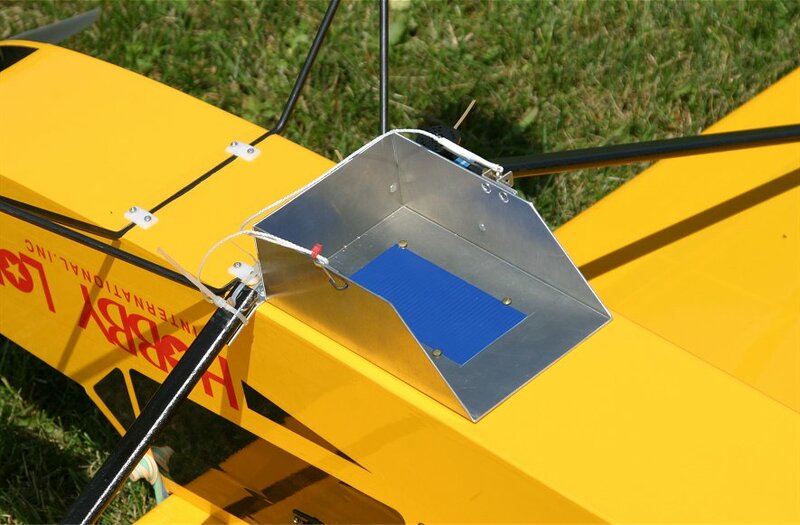 The optional all aluminum constructed drop box can be mounted to the bottom of any airplane. It requires one standard servo. 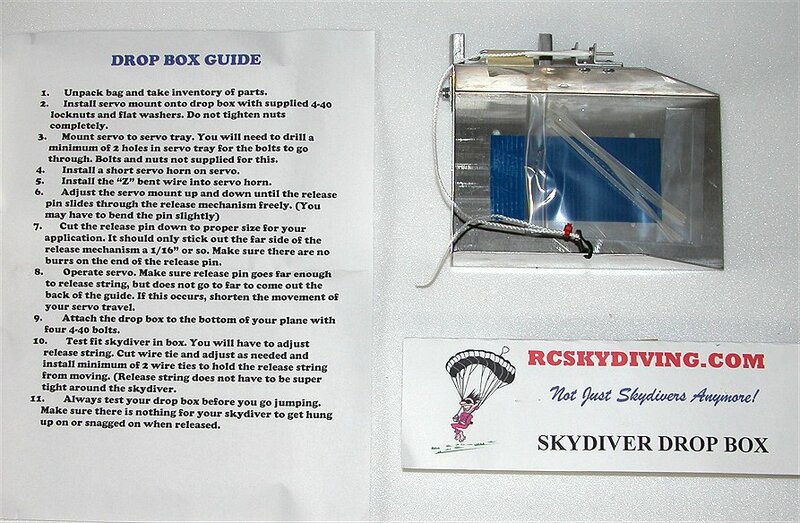 Both the R/C Sky Diver and Drop Box come with complete manuals to help insure proper installation, parachute packing, and, a successful sky dive! A closer look at the unwrapped skydiver reveals some realistic detail and fine craftsmanship. My diver’s jumpsuit is actually an upgrade to a Advanced or Elite jumpsuit. 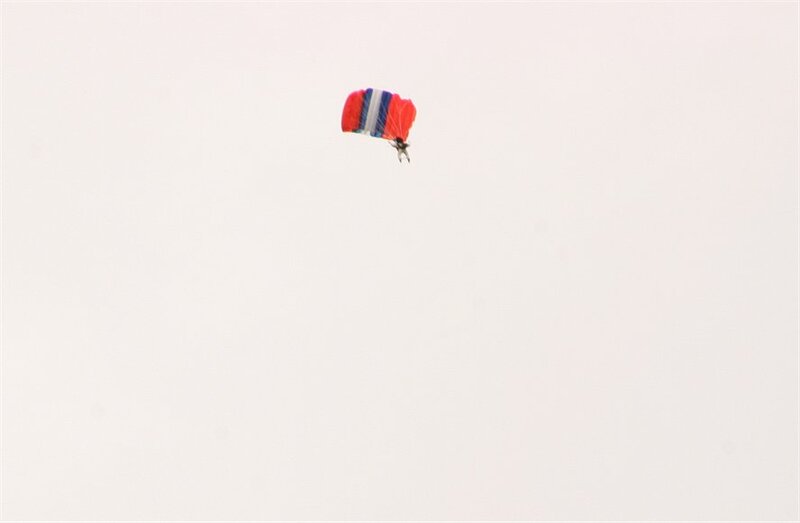 The skydivers are completely upgradable. 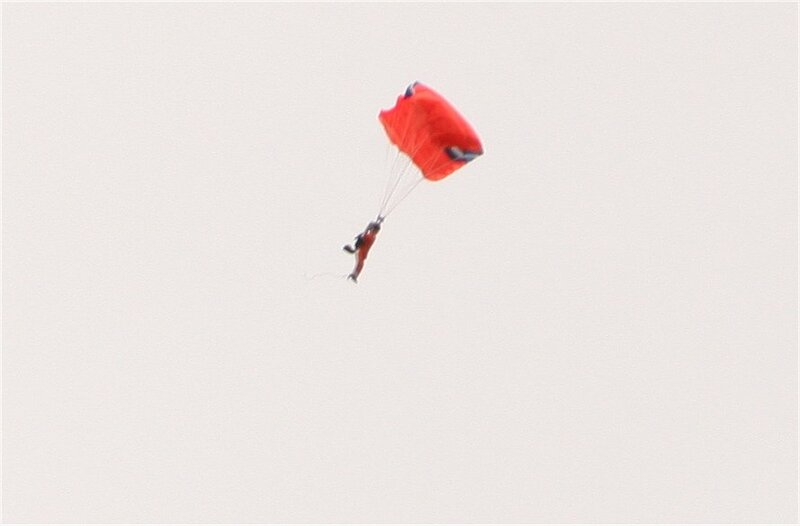 This skydiver could even be equipped with the Elite belt harness system. The parachute is a Beginner series. 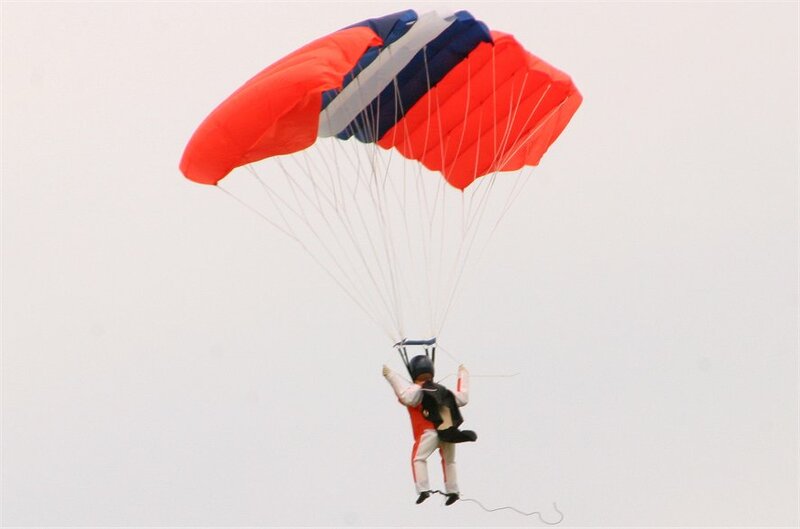 If returned to Skydiving.com at a later date, the parachute could be upgraded to an Advanced chute for a fraction of what a new chute would cost. 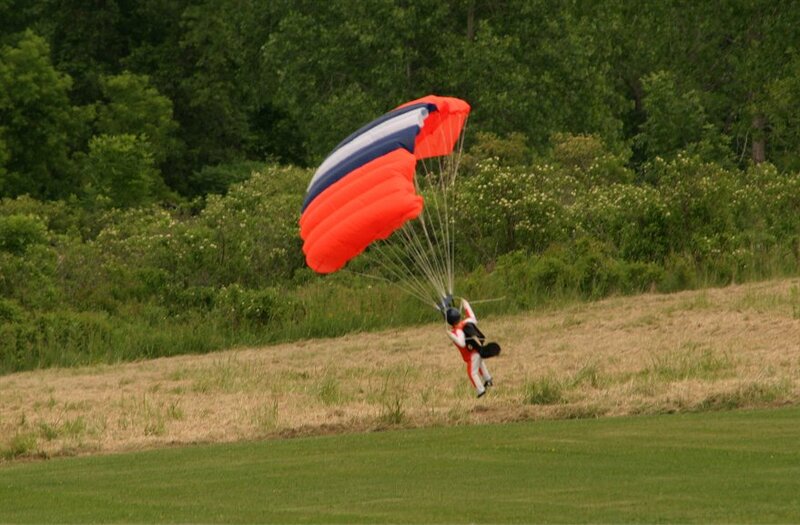 The parachute colors have nothing to do with it being a beginner or an advanced chute. You can have the exact same color chutes that are different levels of performance. The beginner level is slightly easier to pack. 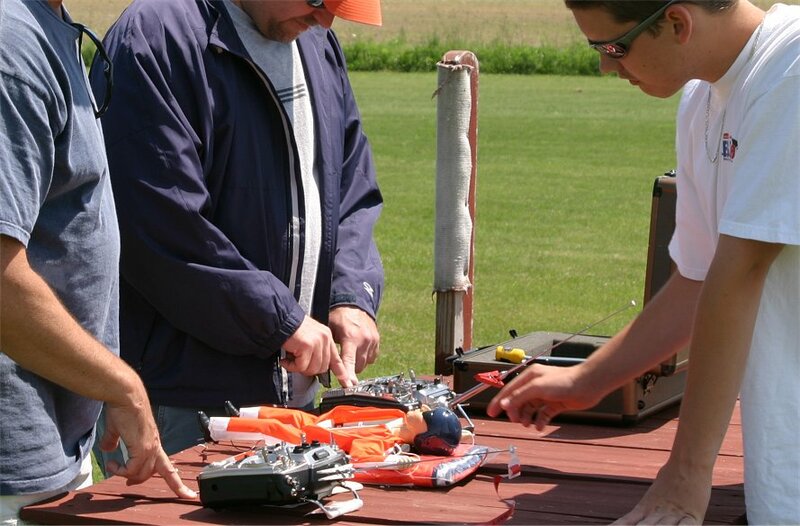 As far as performance, the beginner is best in 10 mph winds and under. 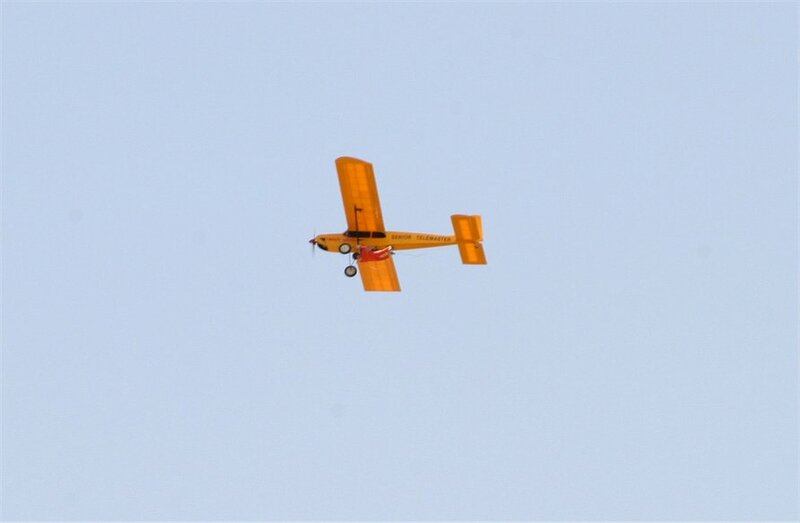 The advanced and elite chutes can be flown in winds up to 14 mph and still penetrate forward. Also, the beginner has a stationary slider (the piece right above the head when the chute is deployed that hold the lines at a set distance) The advanced and elite chutes have a working slider just as in the full scale chutes. 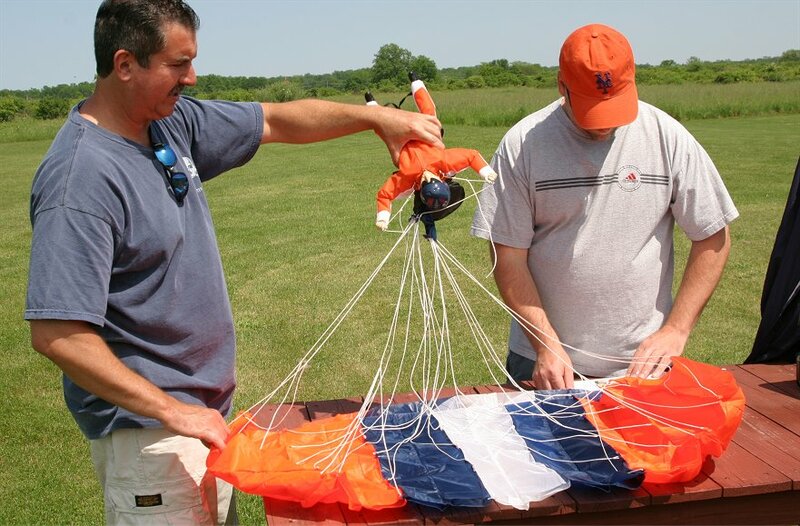 This lets the chute inflate slower and causes less tangles of the outside lines over top of the chute. (known as a line over in full scale). 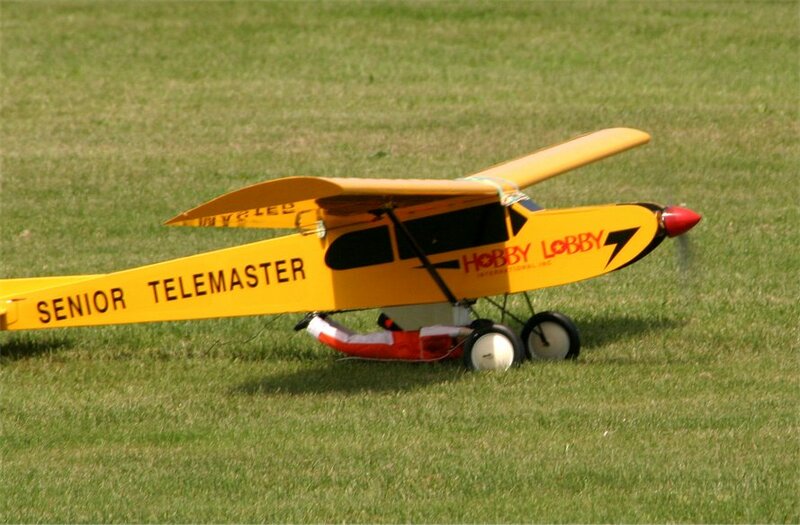 My host plane for the R/C Sky Diver and Drop Box will be the Senior Telemaster ARF from Hobby Lobby. 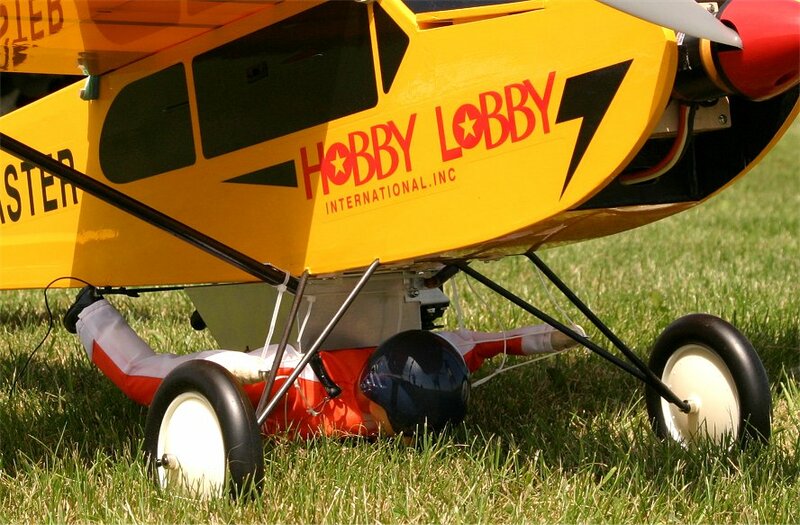 You can see a complete review of this electric conversion on RC Universe here. 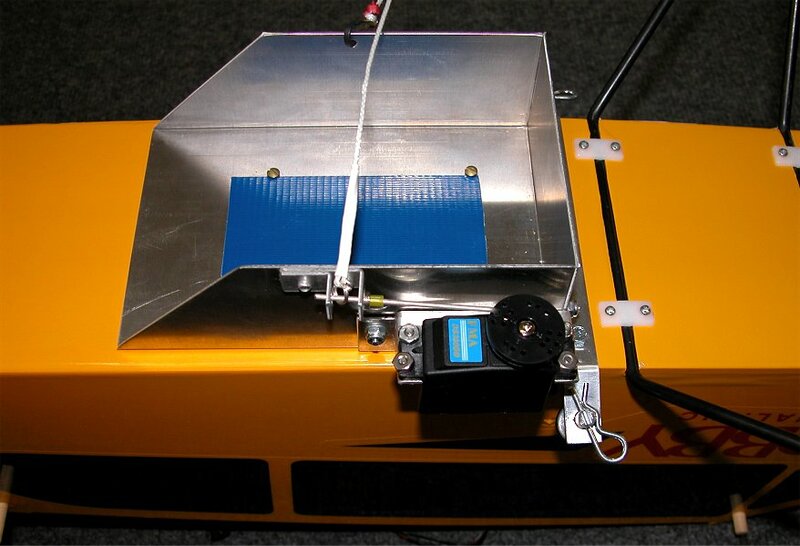 The manual includes severals ways to mount the components inside and also allows for either 2-servo or 3-servo setups. I decided to go with the 3-servo setup which uses the third servo for releasing the parachute. 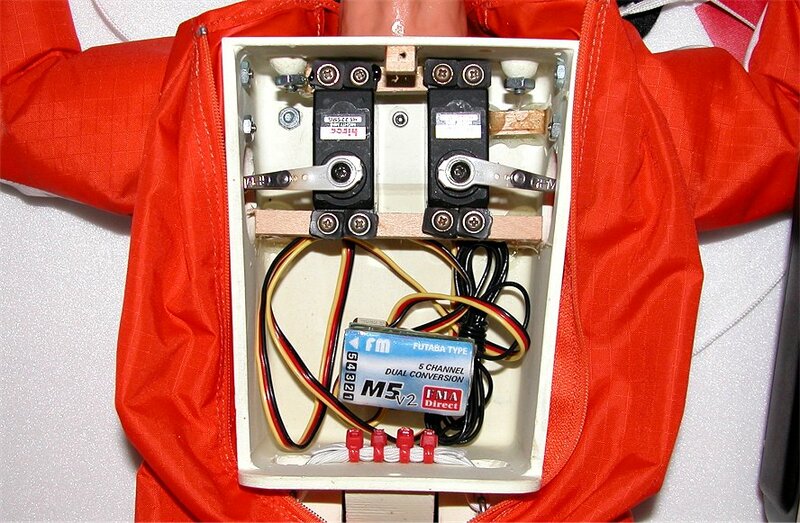 The recommended servos were the Hitec HS-77 low-profile servos for the arm movement and an HS-81 mini servo for the parachute release. 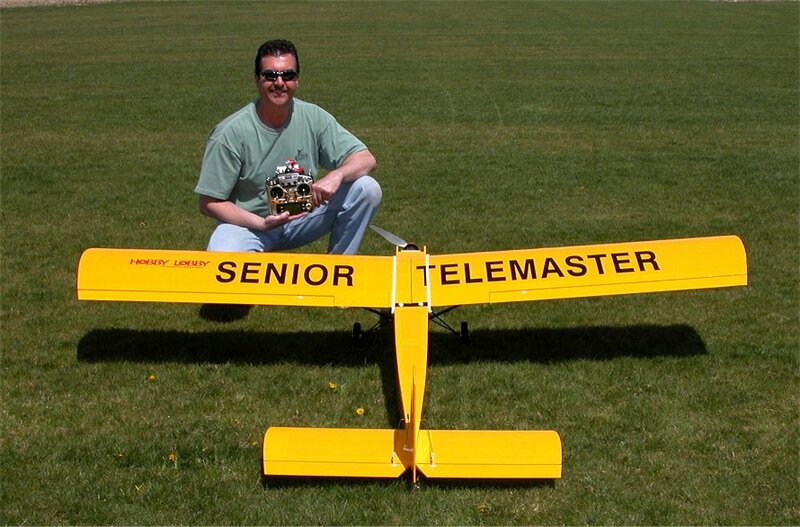 More recently, the Blue Bird BMS-705MG servos were tested by RCSkyDiving.com to be an improvement over the HS-77 servos. These servos have metal gears and 83 oz. of torque on 4.8 volts. I will be using the HS-81 micro servo for parachute release, but, since I already had two HS-225MG mini servos, I decided to use them since they fit in the case properly. My receiver is the “glitch-free” dual conversion M5 v2 micro receiver from FMA Direct. Note that this is not the final position for the receiver. Although a computer radio is not required, it makes setup much easier through programming flexibility. I set up my left stick for moving the left arm and the right stick for moving the right arm. 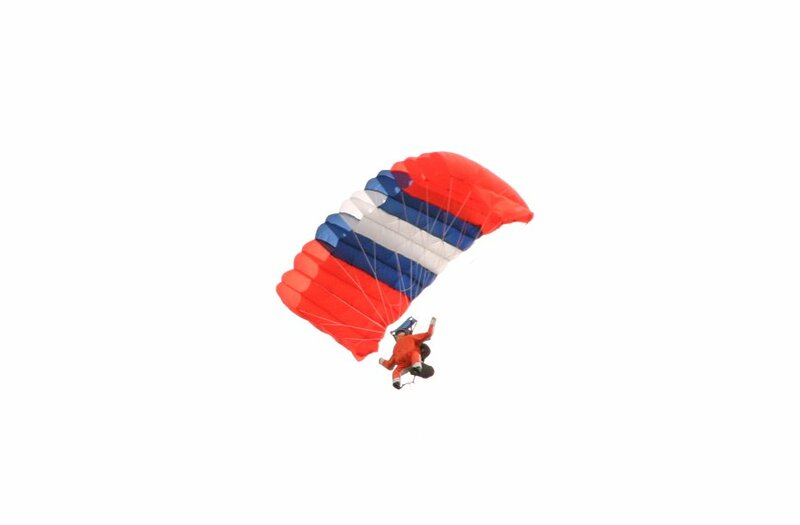 In the manner, the Sky Diver glides to the left when facing away from you and moving the left stick out. The HS-81 servo fit nicely in the corner to allow room for the 4-cell Rx. pack. 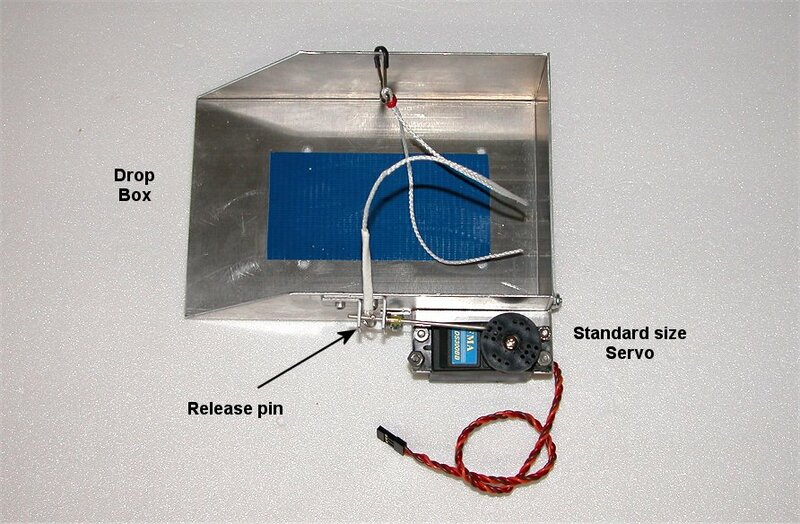 The HS-81 servo is used to deploy the parachute at the flip of a Ch. 5 switch. The receiver crystal is located so I can swap it out with one of my buddies Futaba 9C channels. In this manner, I can fly the host plane and someone else can control the sky diver or visa versa. I cut a channel into one corner and mounted an On/Off switch for easy power access when the chest plate is closed. Note the black antenna bobbin on the left to shorten the physical length of the wire extending out of the pant leg without reducing much range on the receiver. 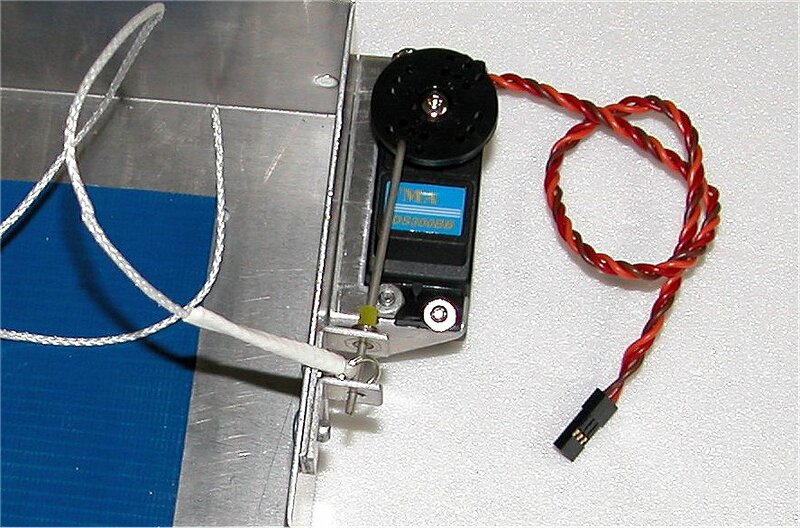 A standard size servo is used to move the release pin. I used a DS300BB digital servo from FMA. A short sleeve is used on the one side of the release holes to keep the pin from falling after a release. Since I am using a 5-channel M5 v2 micro receiver in my Senior Telemaster host plane, the servo will get plugged into Ch. 5 and use the retract switch for dropping. The Drop Box easily mounts to the plane bottom using 4 wood screws. Note that I mounted it across (or close to) the CG line. 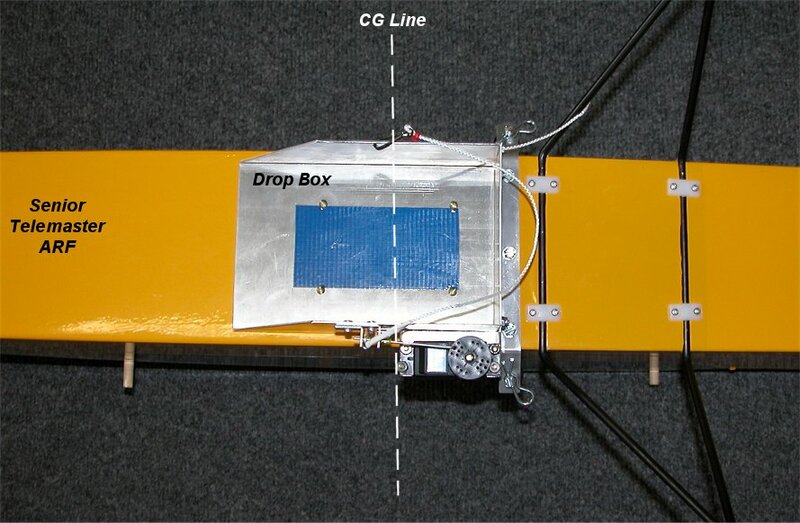 The closed side of the Drop Box faces the front of the plane. 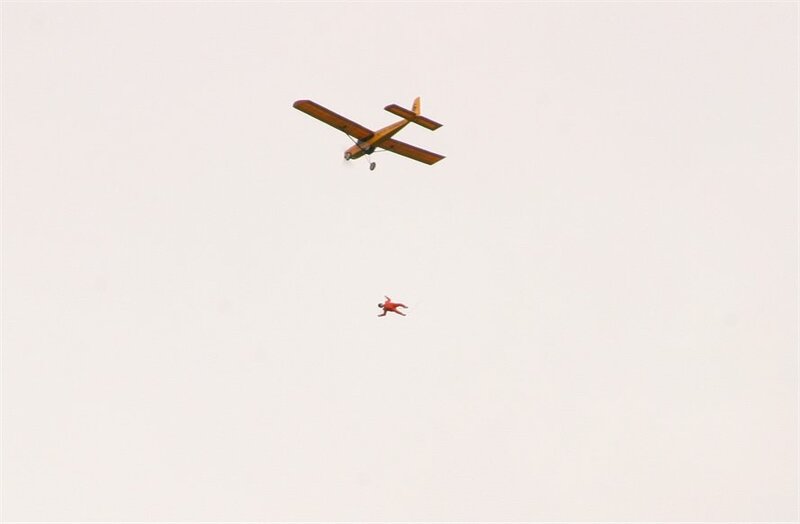 Note: Always leave the chute open and spread out as much as your environment lets you until you are ready to go skydiving. 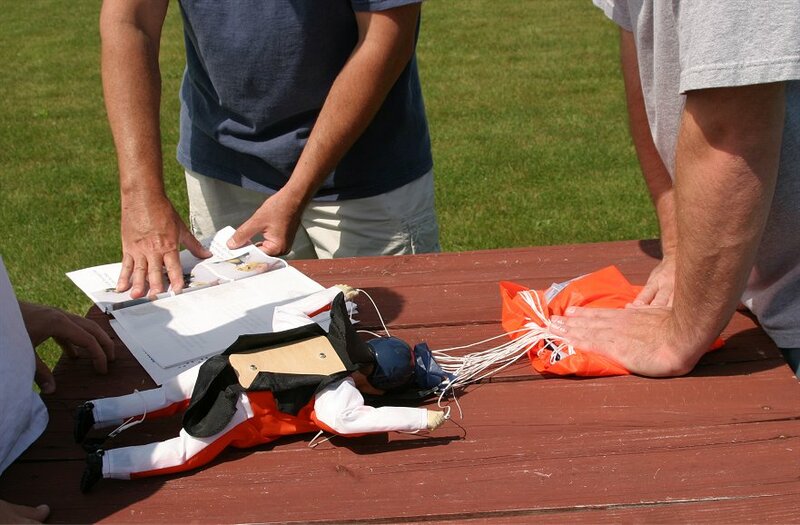 It is best to spread the chute out on the ground when you get to the flying field and pack it up 10 minutes or so before the jump. 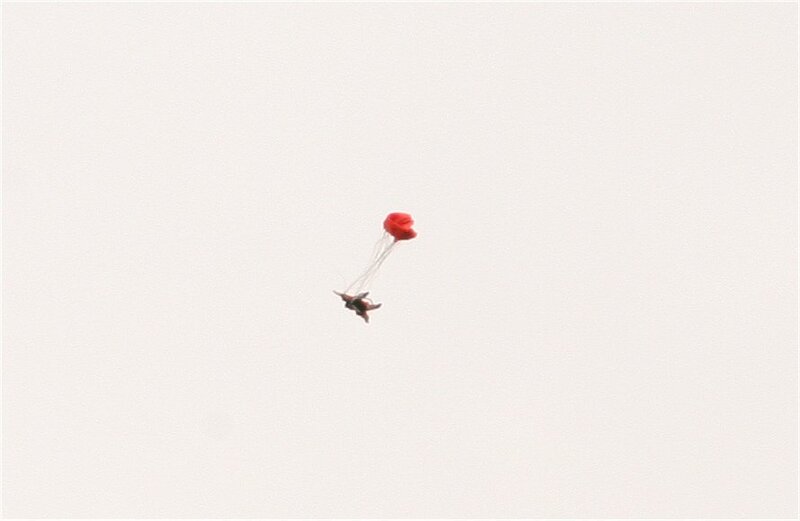 The parachute material does have a “memory”, so if it is folded for a long time, it likes to stay that way. 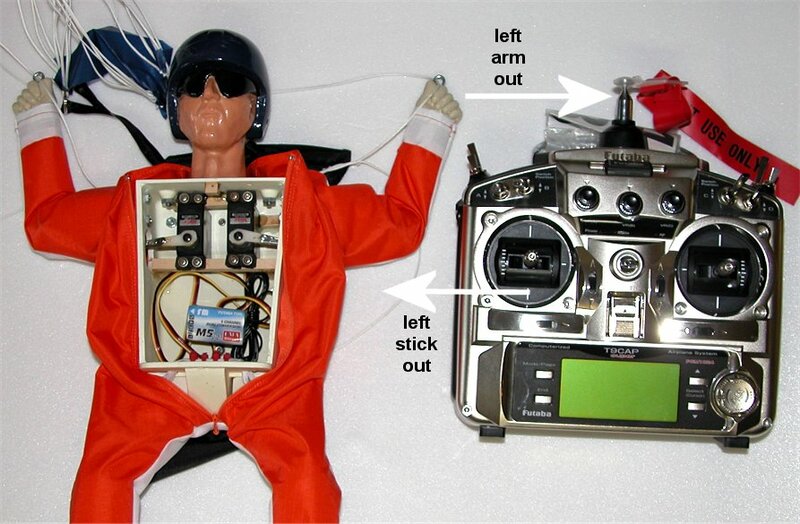 To prepare the Sky Diver for a jump, we first had to swap the receiver crystal to my friends transmitter frequency and then program the radio for proper movement. 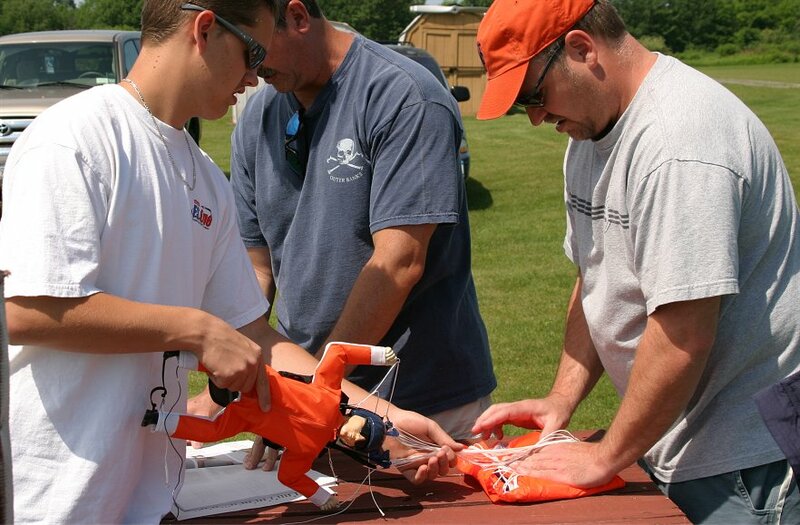 I brought the Sky Diver manual to the field as it has a detailed step-by-step chapter with photos on how to properly fold the chute for a successful deployment. 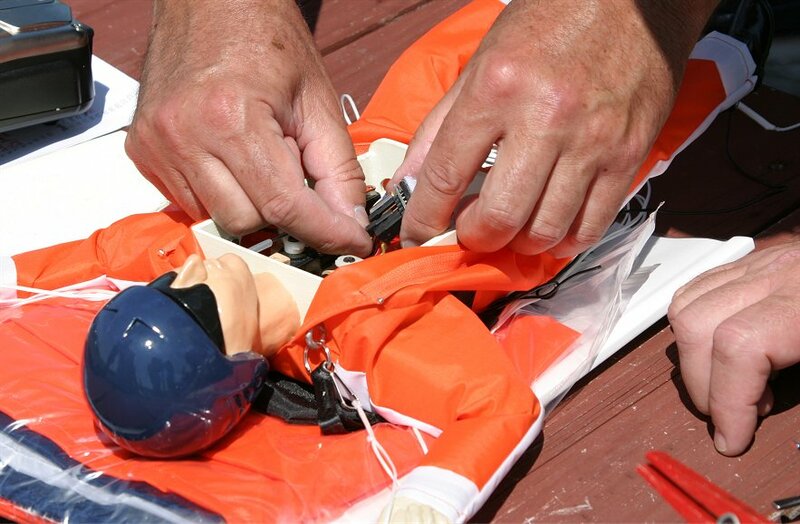 The Sky Diver was placed into the drop box face down so that the chute fit nicely into the box. 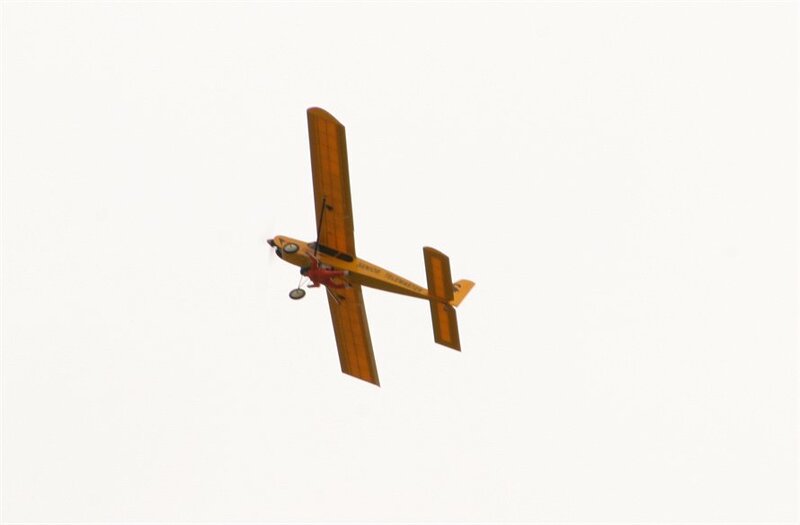 He lightly passed over the grass but was high enough not to cause any issue with the plane. 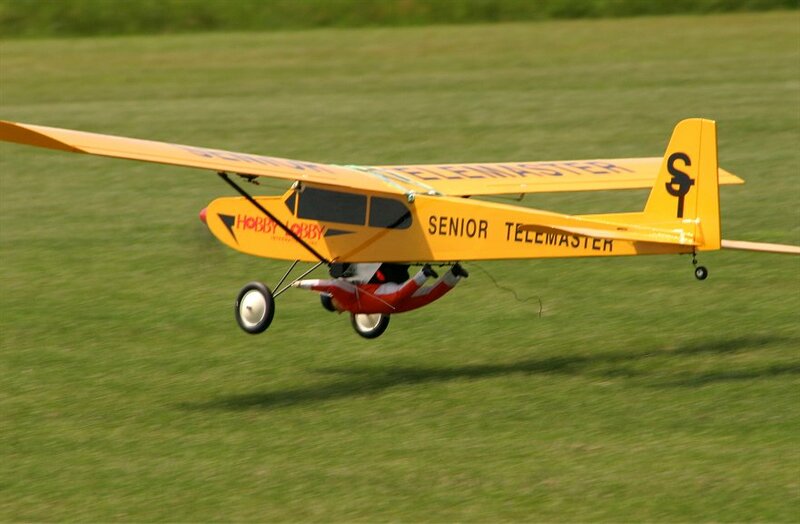 The Senior Telemaster took off like normal even with the added 3lb Sky Diver. 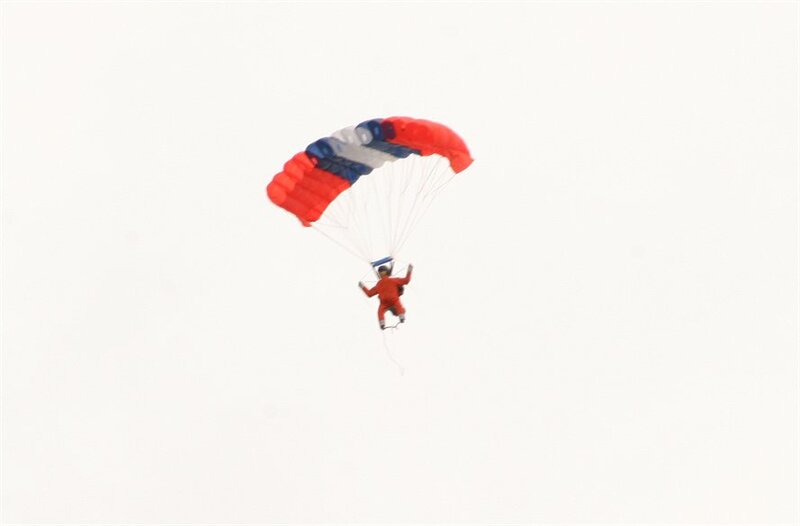 We had a blast with our “Super Dave” Sky Diver on the weekend. 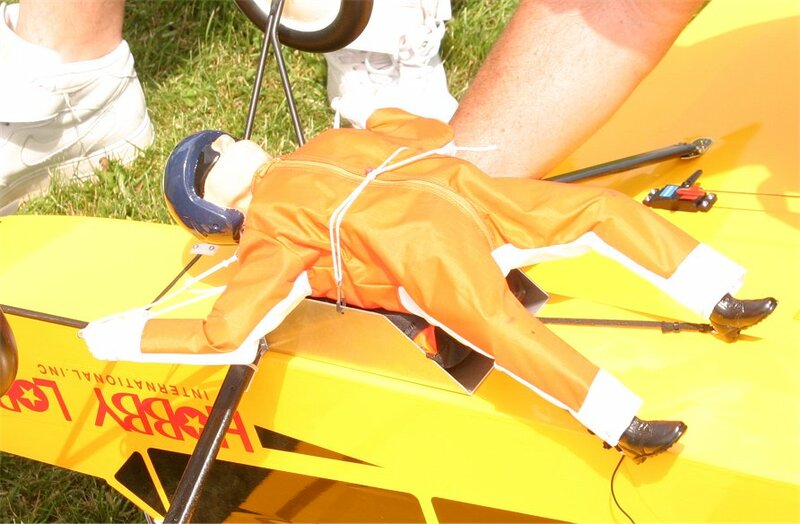 He could free fall very stable and the chute deployed every time. 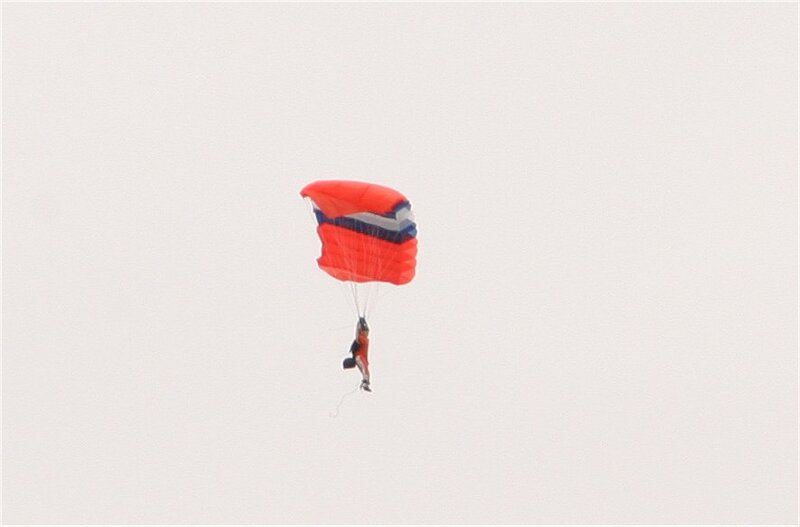 The colors are quite brilliant and easy to see when the chute is open. It took a few jumps to adjust the string tension for proper steering control. The Sky Diver is well designed and works very well. 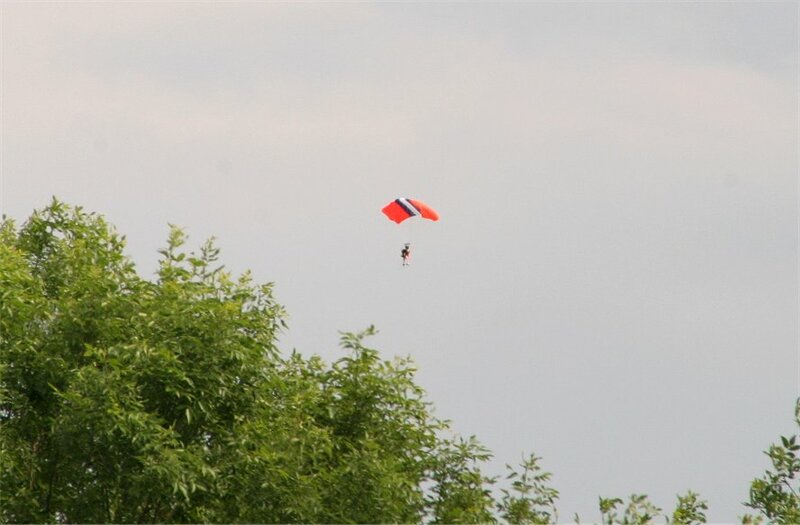 It was a great deal of fun to involve several R/Cers in a coordinated effort from packing the chute, to providing an air lift, dropping, free falling, chute deployment, and finally watching the Sky Diver glide to a safe landing on the field. Although sky diving looks easy, it requires a coordinated effort (or team) of people with various skills and good communication. I would not recommend it to a beginning R/Cer without proper supervision. 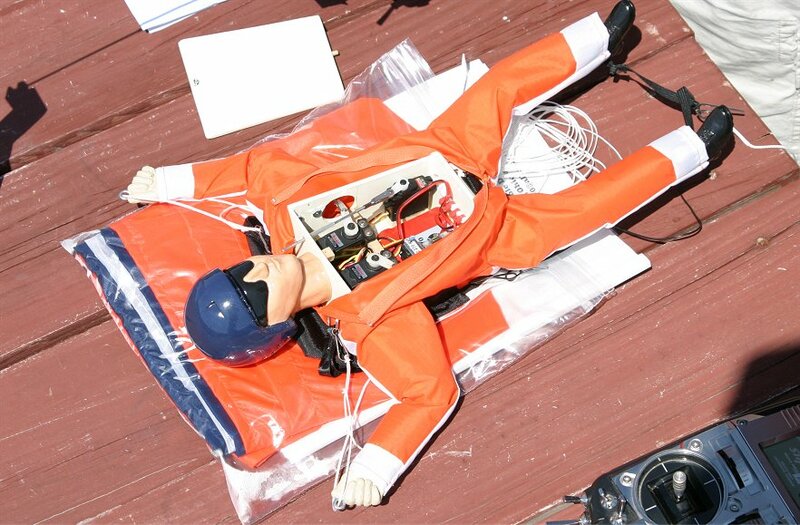 Excessive wind can be a problem for less skilled diver pilots. For a successful start, make the jumps lower on calmer days and slowly build your skill levels until you become a master of elite sky diving!